ROSS, JAMES CLARK. (1800-1862). Arctic explorer who discovered the magnetic North Pole. ALS. (“Jas C Ross”). 3pp. Small 8vo. London, N.d. (Circa 1837). To English Quaker businessman ALFRED FOX (1794-1874), famous as the owner of Glendurgan Garden and known for the collection of minerals he assembled with his brother, British geologist and inventor Robert Were Fox (1789-1877). 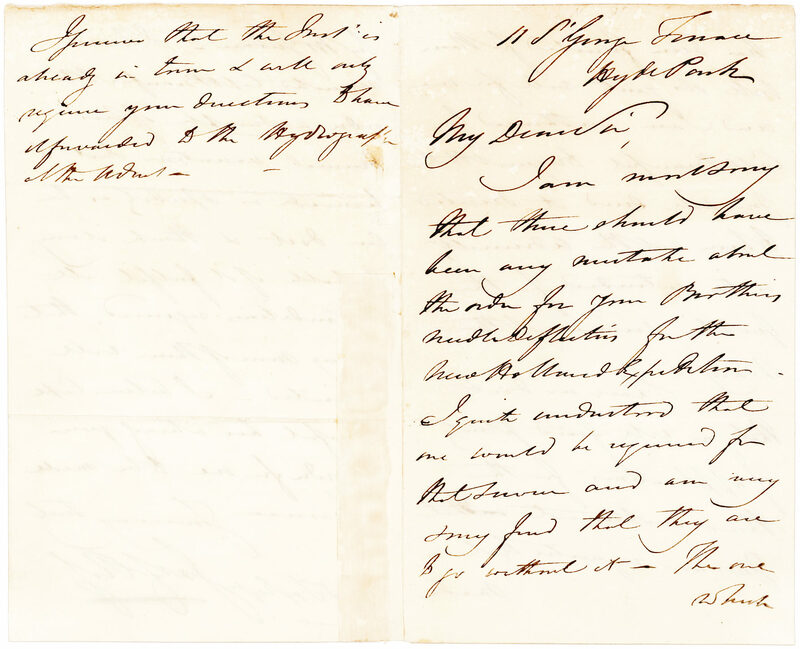 “I am most sorry that there should have been any mistake about the order for your Brother’s needle deflection for the New Holland Expedition. I quite understand that one would be required for that service and am very sorry [to] find that they are to go without it. The one which has been finished for them will do quite well for me and I am authorized by Capt. 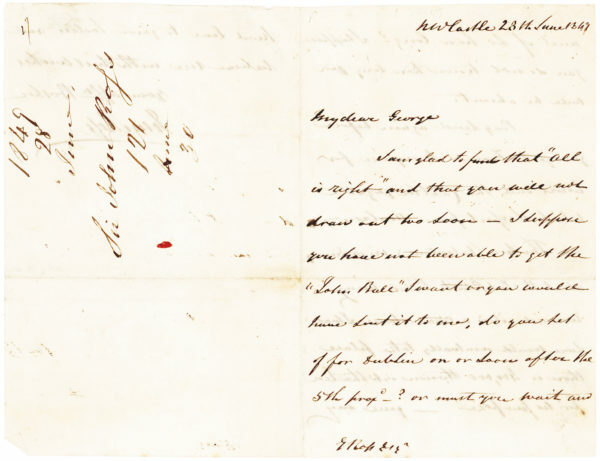 Beaufort to request that you will send it directed to him at the Admiralty as it is intended for the public service of the Navy. 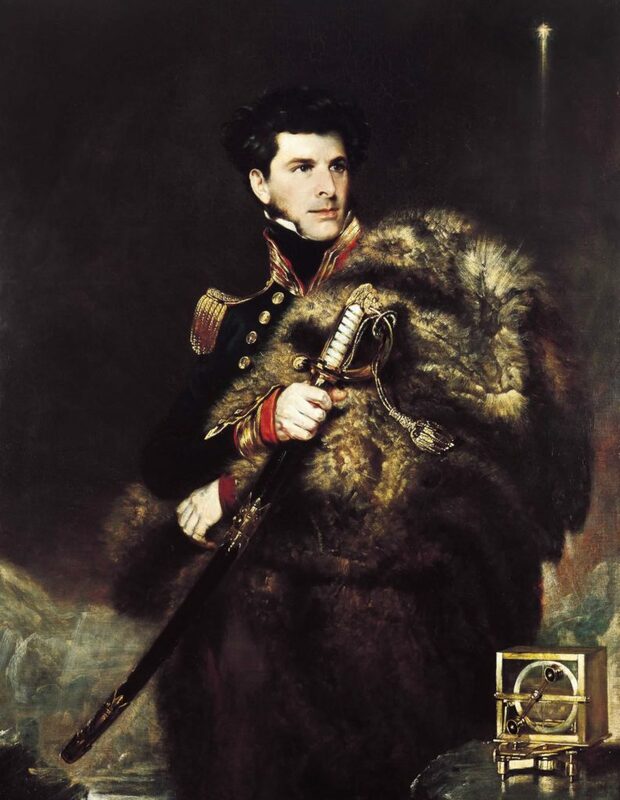 James Clark Ross began his arctic career accompanying his uncle, noted polar explorer Sir John Ross, on his 1818 search for the Northwest Passage, and later joining four subsequent voyages under the command of Sir William Parry. 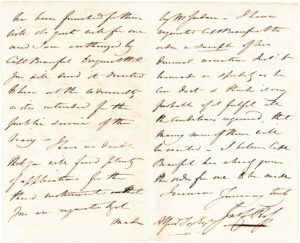 On the second Arctic voyage with his uncle, between 1829 and 1833, Ross discovered the position of the magnetic North Pole, recounted in Narrative of a Second Voyage in Search of a Northwest Passage, etc., including the Reports of Captain James Clarke Ross and the Discovery of the Northern Magnetic Pole, published in 1835. Robert Were Fox, Ross, and several others conducted a magnetic survey of Great Britain from 1835-1839, using some instruments designed by Fox and produced by Thomas B. Jordan (?-? ), an artist and inventor, who was a drawing master to Fox’s children in the Cornish port city of Falmouth, later the site of the Falmouth Meteorological and Magnetic Observatory. Jordon was a founding member of the Royal Cornwall Polytechnic Society and assisted Ross and Fox in their experiments with diurnal variation and electrical action in mineral veins. After moving to Falmouth in 1835, he “rapidly achieved considerable reputation as an instrument model maker,” (A Study of the Royal Cornwall Polytechnic Society, Pearson). Jordan authored a number of articles on the dipping needle deflector and diurnal variation including “Observations on the Diurnal Variation of the Magnetic Needle at Falmouth,” published in the periodical Surveyor, Engineer and Architect in 1840. After the magnetic survey of Great Britain, Ross led his own Antarctic expedition, leaving Margate Roads, England, on September 30, 1839 and continuing through 1843. Aboard the HMS Erebus and HMS Terror, Ross and his crew explored what they named the Ross Sea and Ross Ice Shelf, but the main objective of their expedition was to determine the position of the magnetic South Pole using observations of magnetic declination, magnetic dip and magnetic intensity. Among the tools onboard during the investigations was the improved deflector dipping needle compass, or dip circle, developed by Fox in 1834, and referred to in our letter. The instrument measures the angle between the horizon and the earth’s magnetic field. Royal Navy hydrographer Francis Beaufort (1774-1857) began his career with the British East India Company, making hydrographical measurements in his free time. His interest led the Admiralty to charge him with conducting a hydrographic survey of the South American Rio de la Plata estuary which earned him some renown. He went on to serve from 1829-1855 as British Admiralty Hydrographer of the Navy, during which time his office possessed the finest collection of hydrographical charts in the world and took over administration of the astronomical observatory at Greenwich. As a Royal Society and Royal Observatory council member, and a founding member of the Royal Geographical Society, Beaufort acted as an intermediary between scientists and the Admiralty, overseeing the bulk of maritime experiments. In fact, it was Beaufort who secured government funds for Ross’ measurements of terrestrial magnetism during his 1839-1843 voyage. The Beaufort Sea, north of Alaska, is named in his honor. 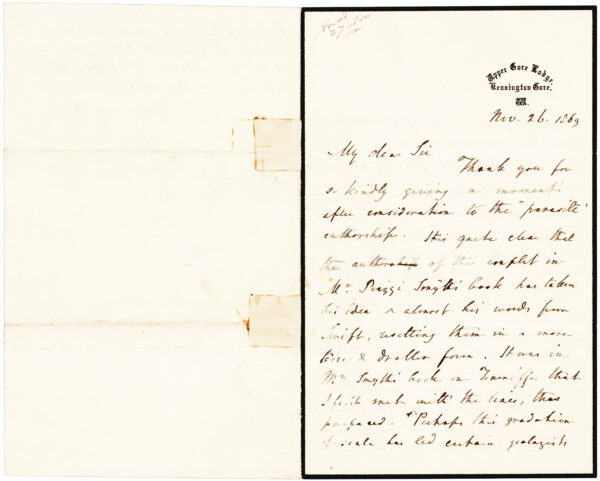 In 1837, 25-year-old George Gray led a small expedition to Northwest Australia, to determine if it was suitable for colonization – likely the “New Holland Expedition” cited in our letter. 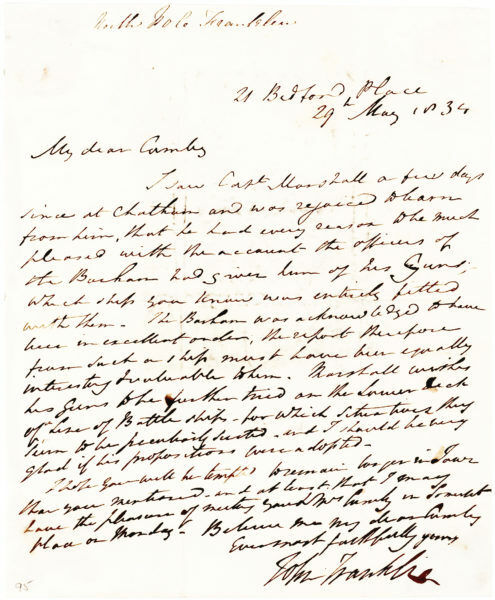 The expedition, which, according to our letter, had a dipping needle deflector compass, was comprised of a mere five people and left Plymouth on July 5, 1837. After a series of mishaps including a shipwreck and Grey being speared in the hip by an Aborigine, the party was rescued by the HMS Beagle of Charles Darwin fame. Undeterred, Gray returned to Western Australia two years later. He became Governor of South Australia, Governor of Cape Colony, Governor of New Zealand, and Premier of New Zealand. 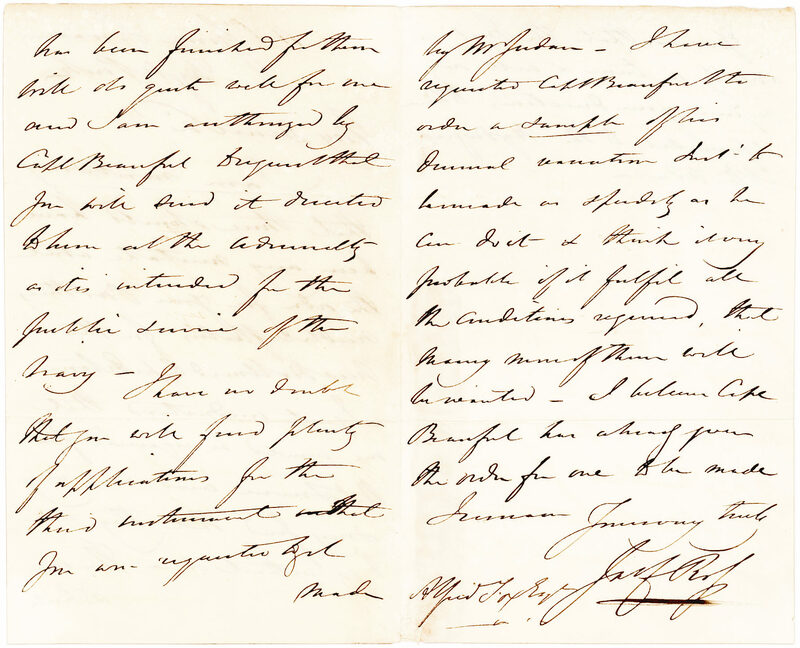 Written on a folded sheet with some light mounting traces on the blank portion of the fourth page; in fine condition. A very rare autograph with important scientific content.